These Felt Lavender Heart Sachets make a lovely home-made Valentine’s gift for loved ones. They can be hung up as a natural air freshener, used to freshen a drawer or put under a pillow to help aid sleep. Sewn lavender sachets are great as first sewing projects for older children, but this “no sew” version is even better for younger children who can first learn about how materials can be joined together to make fun crafts before they go on to learn the skill of sewing. 1. Use template to draw heart shape on felt. 2. Carefully cut out two heart shapes. 3. Apply Bostik White Glue around the edge of the bottom heart. 4. Put one teaspoon of lavender in the centre of the bottom heart. 5. Before you close up the heart, glue the ribbon onto the bottom heart (as shown in the picture above). 6. Apply more glue to this ribbon (as shown in picture above). 7. Loop the ribbon over and glue down. 8. Apply more glue onto ribbon and close the heart sachet by gluing down firmly. Smooth edges of heart to ensure it is closed and all the lavender is sealed inside. 9. Choose your adornments to decorate. You could add letters to make words, buttons or heart shapes. We chose these heart shapes from CraftMerrily but you could also cut smaller heart shapes out of the felt and layer them. 10. Stick on the decorations. 11. Glue ric rac, lace, buttons or sequins around the seam of your heart (in place of decorative stitching). 12. Press all glued items down firm and leave to dry. 13. 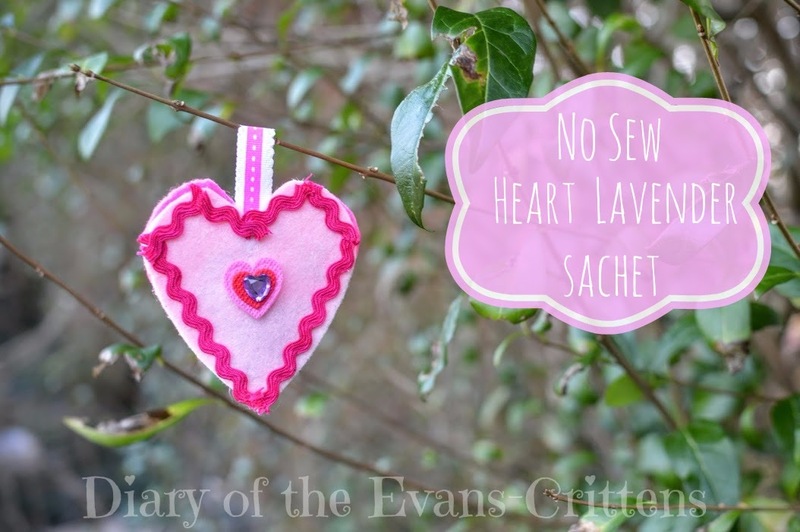 Wrap your handmade No Sew Felt Lavender Heart Sachet in tissue paper and give it to a loved one to hang up and enjoy. For very young children cut out the heart shapes in advance and have everything ready so kids can easily make this no sew craft by gluing and sticking. Remember when applying white glue to a material such as felt, allow the glue to dry for a few minutes before pressing the two surfaces together. Heart lavender sachets make lovely handmade gifts all year around- not just for Valentine’s Day. Let me know if you make this craft in the comments below! More Valentine’s crafts coming soon. Disclaimer: We were sent a box of seasonal crafting goodies from CraftMerrily as part of our role as Bostik Bloggers.